You are here: Home / Chicken / Asian Chicken Lettuce Wraps (Better than P.F. Chang’s)! 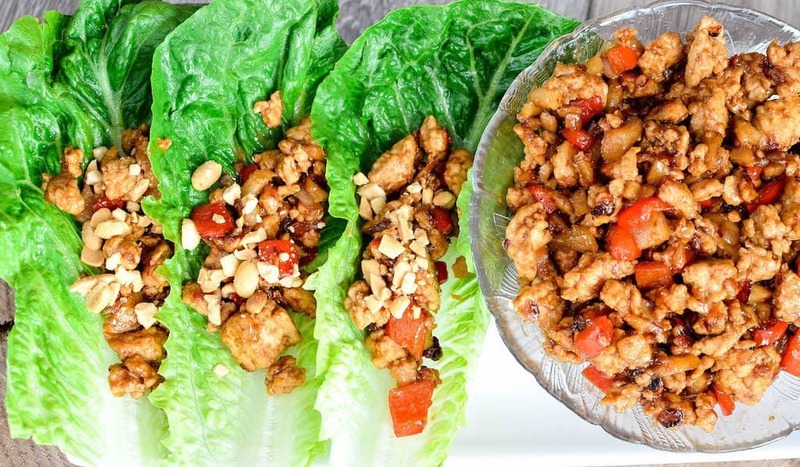 Asian Chicken Lettuce Wraps (better than P.F. Chang’s)! A quick (less than 30 minutes), easy, and healthy dinner that tastes delicious! Gluten and dairy-free! I know that’s a pretty bold claim…Asian Chicken Lettuce Wraps you can make at home that are better than the beloved dish from P.F. Chang’s?! It may be bold, but it’s true! 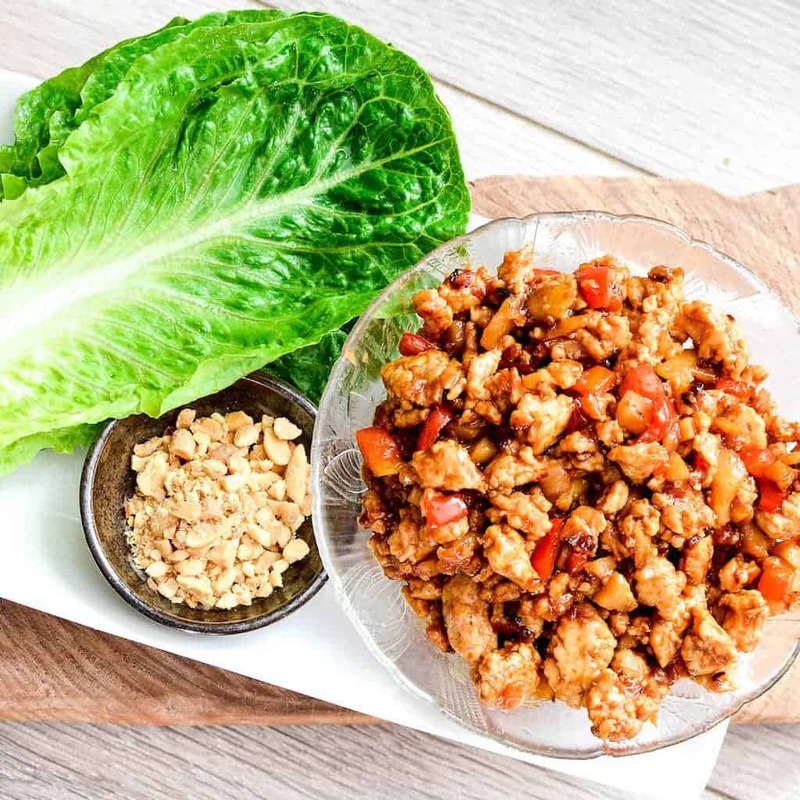 This Asian Chicken Lettuce Wraps recipe is one that took me years of trial and error, and lots of taste-testing, to get it just right. I’ve already discussed my love for Asian food here and here. These Asian Chicken Lettuce Wraps wraps are one of my favorite dinners. They are quick and easy and my whole family loves them. Even my kids eat them, and have tons of fun doing it! Brown the ground chicken! This recipe is very straightforward! There is, however, one very important step and that is to brown the ground chicken. Making sure the chicken is nice and crispy and brown is essential to the overall flavor and texture of this dish! Use a Wok, Sauté pan, or a cast iron skillet. For traditional Asian recipes I love pulling out my wok. But as you can see in the photo above, a regular sauté pan or cast iron skillet works perfectly! Dice the vegetables very small. This is one of the keys to making sure every bite is bursting with both texture and flavor! Sometimes I even let my food processor do the chopping for me! The sauce! Oh please, I bet you, do not tamper with the sauce. That is the part of this recipe that took me years to perfect, and is absolutely delicious as-is! What lettuce is best for wraps? Just be sure to choose a head of lettuce that has large and flexible enough leaves to use as a wrap! It’s actually very simple! Just cut the bottom part of the head of lettuce off. Then carefully peel away each lettuce leaf! Don’t forget to wash and dry the lettuce leaves before serving! I prefer to eat them the traditional way…as lettuce wraps! 😉 However, to be totally real with you all (because that’s the only way to be), I usually serve these Asian Chicken Lettuce Wraps to my kids over noodles or rice, because it’s much easier for them to eat with a spoon than wrapped in a piece of lettuce! As always I recommend making this recipe exactly as it’s written! Like I said, I tested and retested this recipe more times than I can count to achieve lettuce wrap perfection! However, here are a few potential substitutions! Ground chicken: Finely diced chicken breasts are a great substitute for ground chicken! Peanut Oil: Any oil can be used here if you don’t keep peanut on hand or if you have a peanut allergy. I recommend olive oil or avocado oil! Soy Sauce: If you have a soy allergy you can substitute coconut aminos for the soy sauce. Peanut Butter: If you have a peanut allergy any nut or seed butter could work here, but peanut butter definitely gives the best results! 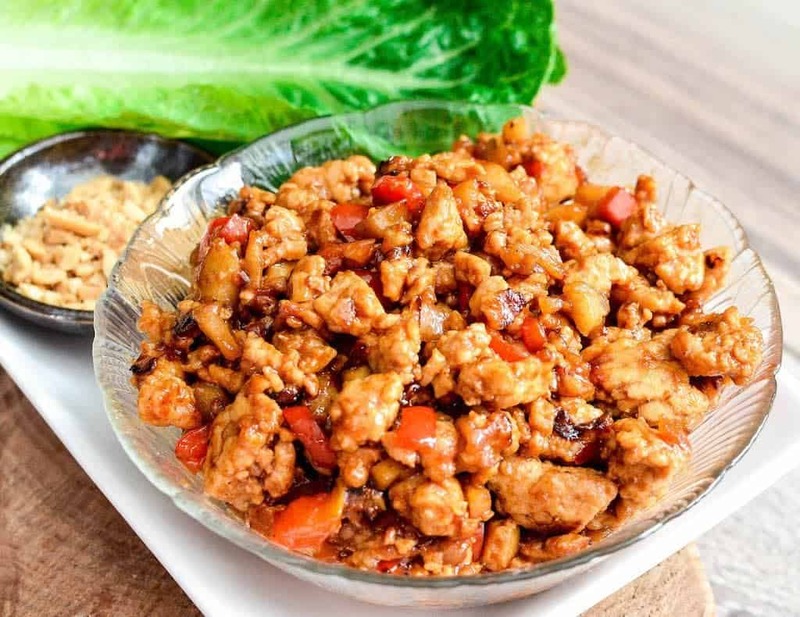 Asian Chicken Lettuce Wraps (better than P.F. Chang's)! 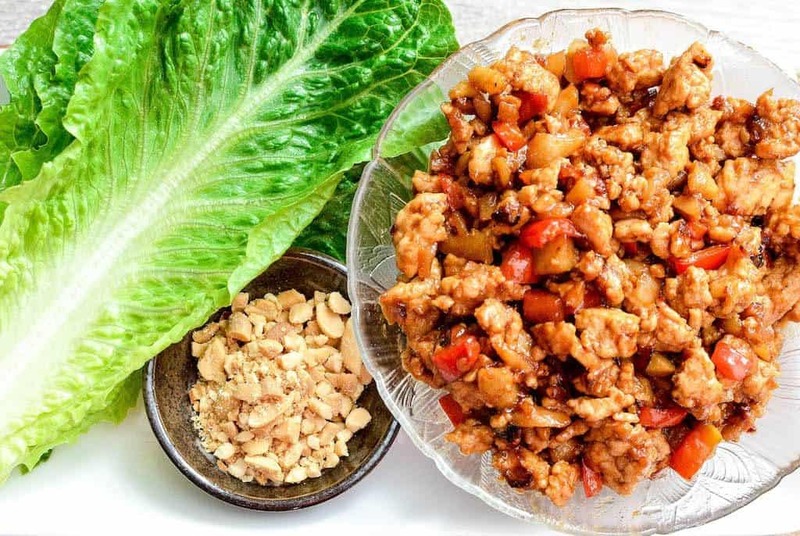 Asian Chicken Lettuce Wraps (better than P.F. Chang's)! A quick, easy, and healthy dinner that tastes delicious! Gluten and dairy-free! 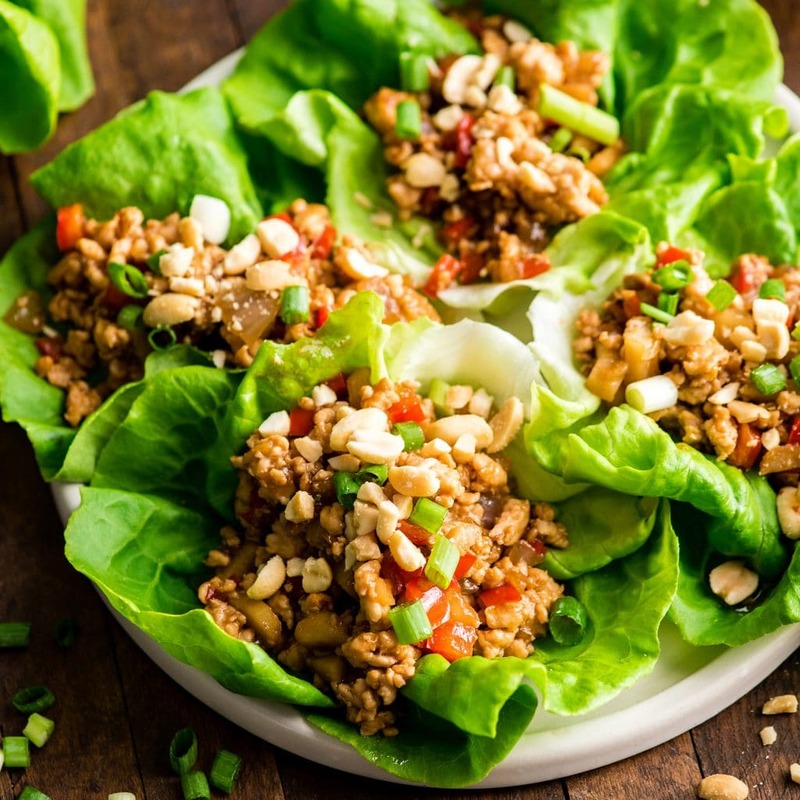 *be sure to choose a gluten-free soy sauce to keep this asian lettuce wraps recipe gluten-free, like this one. **be sure to choose a gluten-free hoisin sauce to keep this recipe gluten-free, like this one. I just have to rave about this recipe, specifically the sauce! After making a number of Asian inspired recipes and always being disappointed with the sauce (either completely lacking flavor, being too salty, etc), my expectations were low. BUT, this sauce is literally perfect in every way. Your years of perfecting it paid off because it is the BEST! Hi! Made these tonight and they are wonderful! One question though do you think this could be made ahead and frozen? This is the 4th time I’ve made this wonderful recipe and it just keeps getting better. I add chopped carrots and mushrooms with fresh garlic and ginger. I’m also interested if it can be frozen? Going to make this tonight! When you serve it for dinner, what else do you serve with it? Hey Sandy! I ususally serve it just in wraps for Ritch and I! For the kids I serve it with rice or noodles! Delicious! A little sweet for my taste so I may leave the honey out next time, but still very very good. Even very picky hubby who has never touched a lettuce wrap loved them. Thanks for the great recipe! LOL! I always think of Ron Swanson from Parks and Rec when I make salad for my husband. When asked if he wanted salad he replied, “Since I am not a rabbit, no, I would not. LOL! I’m so glad you both enjoyed these! I made this recipe last night for my boyfriend and it was perfect! Simple, Fun, and hands down delicious. I pre-made the sauce and replaced the soy with coconut amino s; and pre-choppped the veggies for a quick and easy assemble for when we were ready to eat. I added finely chopped carrots and mushrooms, green onion, and chopped cashews for a crunch on top. I’m SO glad you enjoyed it Jessica!! Love your additions too!! I like your additions. Those would extend the meat a bit more. I also like how you did the veggie chopping ahead. I doubled the recipe, but found it took more than double the time due to all the chopping. I’m used to that, and to recipes that usually say they take less time than they do. It was delicious. I had some collard greens I needed to use up, so I used those for the wraps. My husband preferred using knife and fork, the second night I stir fried the rest of the collards with the swiss chard I served alongside, made some quinoa, and served the veggies and meat on top of the quinoa. Delicious! A little sweet, so I may leave out the honey in the future, or at least reduce it. Have you tried chopping your veggies in a food processor? It cuts down prep time significantly! 🙂 I’m glad you enjoyed it, I love the idea of using collard greens too! No, I have not tried a food processor for chopping veggies. Good idea! Amazing!!! Made it for the boyfriend, he loved it! I love the peanut butter in the sauce. Our usually lettuce wrap recipe isnt as good as this one, thank you thank you! YAY! So glad you loved them Elizabeth! YAY! I love hearing that Rebecca! Thanks for stopping by to let me know you loved them! 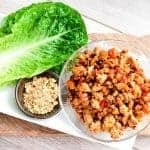 This review is just for the sauce: I tried out your blend for sauce on my take of a healthy turkey lettuce wrap and oh my goodness, the sauce is INCREDIBLE! Definitely a keeper in my books for regular meal prep rotation. Thanks so much!! In case anyone is curious, my meat filling includes 1lb of Jenny-O low fat ground turkey, 1 medium zucchini diced, 1 cup of diced mushrooms, 3 thinly sliced green onions, 1/2 cup of shredded carrot, and an 8oz. can of water chestnuts (drained and chopped). Most of the prep work is taken care of by my vegetable chopper/dicer (around $15-20 on Amazon). To bump up the spice, I also serve this with some Sambal Oelek on the side to add as you eat! Thank you Kristie! I’m SO glad you enjoyed them! Thank you Kristie! I’m so glad you enjoyed it! Made this recipe the other night and it was delicious! Will definitely be making it again! LOL to each their own! 😉 You can always add a different ingredient for a little crunch! These were delicious!! We will be making them again! This recipe is AMAZING!!!! In fact, we are enjoying it twice this week. Thank you so much for sharing!! I totally agree when it comes to the sauce—do not alter, it is perfect and oh so tasty!! I’m not too fond of the messiness of lettuce wraps (but LOVE the flavor!) so we shredded the lettuce the first night, and had chow mein noodles the second time. Both delicious! Try this recipe—-you will LOVE it!!! Thank you SO much Penelope for stopping by to let me know how much you love it!! Mom of three age three and under from Cincinnati, OH. I’ve been making these for two months now and I’m obsessed! I double the batch, add two chopped zucchini, 2 red bell peppers, 1 large diced carrot and about a pound of sugar snap peas. My kids and husband eat with rice and I eat over spinach and romaine. So yummy! Thanks for the recipe, love sharing it with family and friends. I LOVE this recipe, I made yours this summer, and loved it. Then tried a few others out there, and this is the winner for sure. However, I was just looking it up again to make for my parents this week, I noticed that you call this a gluten-free recipe. For the record, Hoisin Sauce is NOT gluten free. You can find G-free hoisin sauce out there, but as a rule, the basic stuff you buy in the store is not g-free. 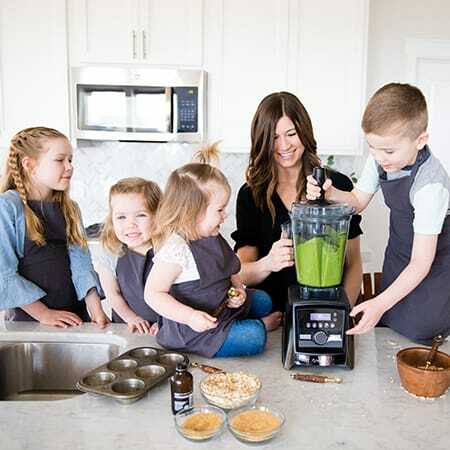 Just wanted those that don’t know that sneaky little detail not to officially call it a G-free thing at a potluck – you’ll hurt the celiacs out there without knowing it. Hey there! That is true! I made sure to note that in the recipe card! I made these lettuce wraps today and they are delicious. I did not change a thing in the recipe and I couldn’t stop eating them. I use a small food processor to chop up the onion, red pepper and chestnuts very small. I served in Boston lettuce leaves. Soooooo good!!! Thank you Kari!! I’m so glad you loved them! Thank you Sarah!! I’m so glad you enjoy them! They’re a favorite around here for sure! Hi! Looking forward to making these for dinner. The recipe calls for 1T of oil but the detailed directions say to heat 2T. Which one is your recommendation? Thanks! I’d start with 1 and add more as needed! I was nervous about this because I haven’t tried anything like this before. They were amazing. My husband loved them, too. I used different meat/veggies, but followed the sauce directions. If anyone is interested–I used shrimp, carrot, and green onion. Thank-you! YAY! I’m so glad you and your husband enjoyed this recipe Deborah! I have made these a few times but have never told you how much I enjoy them! I have made several versions of PF changs lettuce wraps but this sauce is to die for. I don’t use the honey anymore (it’s plenty sweet IMO from hoisin and sweet chili sauce), but the peanut butter just makes it awesome. 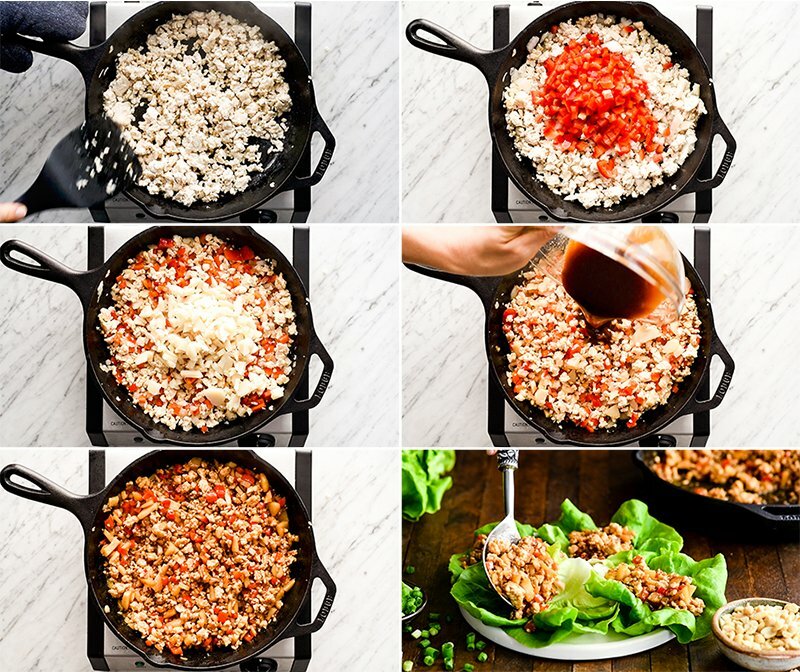 I also like to add equal parts minced mushrooms to the ground turkey…it’s a good way to get my kids to eat them without noticing. Thanks for a great recipe! Just made these tonight and it was delicious! I’m counting carbs and was just wondering how many lettuce wraps equal the 24 carbs? I know the recipes says it serves six people but how much is one serving? Favorite new recipe! This will be in regular rotation at our house. Thanks so much! Don’t mess with the sauce. It’s perfect. YAY Sandi! I’m so glad you enjoyed it! We made the lettuce wraps tonight! They were soooo good:) I love finding new recipes that my family actually likes:) Thank you for this recipe. The sauce is absolutely perfect! 1) I used ground turkey because the store didn’t have enough ground chicken and didn’t want to mix meats. 2) Ran out of sesame oil so used 1 tbsp olive oil to make up the difference. I quadrupled this recipe, 😳 feeding a team of 10 plus coaches. Using romaine. Do NOT change a thing about the sauce, it’s perfect! For the Rice Vinegar, do you use seasoned or unseasoned Rice Vinegar? I’m hosting an open house style function and would like to prepare this recipe, any suggestion as to how much I should make for about 50 people (mostly women)? I could see more than 50, but I think that’s a pretty safe guesstimate as not everyone attending will eat, I’m sure. I appreciate the input. The recipe sounds delicious and easy to make. Outstanding. Made it in 30 min. Added some shredded carrots and celery minced finely. Got five stars reviews from 15 yr old son wife and I. 12 yr daughter on other hand…..well some of you know how that goes. Great Recipe!!!!!! !thumbs up. Good job Laura!!! Made this tonight for my husband and 10 year old son! We all loved it so much! My son said I should enter a cooking contest. Then when I gave you credit, he said that you should enter a cooking contest. 🙂 Thank you for sharing this with us! Really good! Especially the sauce! Everyone in my family loved this recipe. What is your suggestion to add some heat to it? Thanks! Made this tonight and it was a big hit! My four year old didn’t want to try them and my seven year old convinced him by saying “I thought it would be gross too, but it’s not- try it- IT WILL BLOW YOUR MIND!” hahaha. I used cashew butter instead of peanut butter and avocado oil instead of peanut oil. Thanks for the great recipe! I made these wraps tonight for dinner. They were amazing. My husband actually said “These are better than PF Changs!! ” Ha ha! It can be so hard to please everyone at the dinner table sometimes. However, everyone loved them! Thank you for sharing this recipe!!! My absolute favorite hoisin sauce is Lee Kum Kee Hoisin Sauce (<- link)! It's even gluten-free!! I used the sauce recipe for my pork carnita lettuce wraps and I must say it was a pretty good base sauce- I will agree it was too sweet I’m not even sure it was the honey as I took the advice of a couple other reviews and added less (I feel like the acidity added to the sweetness) I actually added about a cup of water until it mellowed out the intensity of it- and some red pepper flakes for some heat-but mixed with everything it was really good I will definitely use it again and just add the water which also helped the sweetness. Thank you!! Tried this for the first time tonight – delicious!! No need to change a thing, but I like how flexible the recipe is as there’s lots of great suggestions for other additions in the comments. This will be in regular rotation at my house. Thanks! Tonight I tried this with tofu instead of chicken. Came out great! I sauteed the onion, water chestnuts and some really finely chopped mushrooms, then removed from the pan. I pressed the tofu, crumbled it and let it cook until it was pretty dry. Then I added back the onion mix and the sauce. I liet it sit over low heat stirring occasionally and it got a really nice dark color. Delicious! You absolutely can use avocado oil! I absolutely love this. So delicious, but wow – the calories? Is there a way to make it with less calories without skimping too much the taste? I think 200 calories and 18 g of protein per serving are some pretty good stats. I don’t recommend changing the recipe! Thanks. I agree but I can’t have just one! That’s how good they are. Will practice self control and definitely will make these often. Didn’t mean this as a complaint. Thanks again for the recipe!!! I have a couple of friends who go to P F Chang’s specifically for the lettuce wraps. I made these yesterday and invited them for dinner. “This is so gooood” and “OMG I cant stop eating this” “can you make this once a week?” were the comments I got at the dinner table! Really delicious! The prep is a little time consuming but chopping vegetables is therapeutic for me. Great recipe! I served this with cauliflower fried rice and roasted sesame broccoli. I made this for dinner tonight and used Beyond Meat crumbles and it was so, so good. My husband is the critic and he said “that recipe is a keeper”. Thank you so much for perfecting the sauce. We love, love, love it! We will be eating it a lot this summer. I’m so glad I found your recipe.